Two weeks ago I reported on one of Oakland’s largest landlords, Neill Sullivan, the man behind the Sullivan Management Company (SMC). Sullivan’s firm manages three real estate investment funds named REO Homes. These three LLCs own approximately 270 properties, mostly single family houses and apartment buildings, mostly in West Oakland. Residential properties owned by REO Homes, LLC, REO Homes 2, LLC and REO Homes 3, LLC. Neill Sullivan’s business is a for-profit venture, but he and his employees say that they’re seeking a “triple bottom line” that will show positive social justice and environmental gains, in addition to monetary gains. Integral to Mr. Sullivan’s real estate play are the deep-pocketed investors and financial institutions backing him. These investors, and one of the banks supporting his acquisition of Oakland housing stock, also claim to have a triple bottom line emphasis that looks beyond profit. As I explained in the story, one of these investors is Tom Steyer, a retired San Francisco hedge fund manager who amassed a personal fortune of well over a billion dollars. Steyer put up personal money to support REO Homes, LLC, one of Neill Sullivan’s acquisition funds. And a bank that Steyer and his wife Kat Taylor founded in 2007 also made loans to REO Homes, LLC to finance property acquisitions. But there’s another place that the One PacificCoast Bank’s profits have been going besides philanthropic ventures, according to tax records of the Foundation. The One PacificCoast Foundation, the non-profit that owns the banks’ stock, has been heavily indebted to Tom Steyer. Steyer loaned the OPC Foundation $26.5 million to allow the Foundation to purchase 100 percent of the One PacificCoast Bank’s stock, effectively capitalizing the bank, according to the Foundation’s recent tax records. The OPC Foundation has been paying back that loan to Steyer, and according to a tax file from 2011, the Foundation paid $2.246 million in balance due. Thus a lot of the profit generated by the One PacificCoast Bank that was channeled back to the Foundation was used to pay back Steyer for the loan, in addition to being doled out as grants to non-profits. One PacificCoast Bank is linked to other major real estate investors besides Neill Sullivan. In fact, the One PacificCoast Bank and Foundation exist in a complex network of real estate ventures where the lines between for-profit enterprise, and tax-exempt philanthropy are blurred. The One PacificCoast Foundation’s links to Bridge Housing Corporation are a case in point. What qualifies projects like these as non-profit and affordable is that a portion of the units are set aside for renters below the area’s median income level. For example, the Mural apartments going up next to MacArthur BART will include about 90 “affordable” units, or about 14 percent of the total. Not-for-profit doesn’t mean the executives aren’t highly paid. 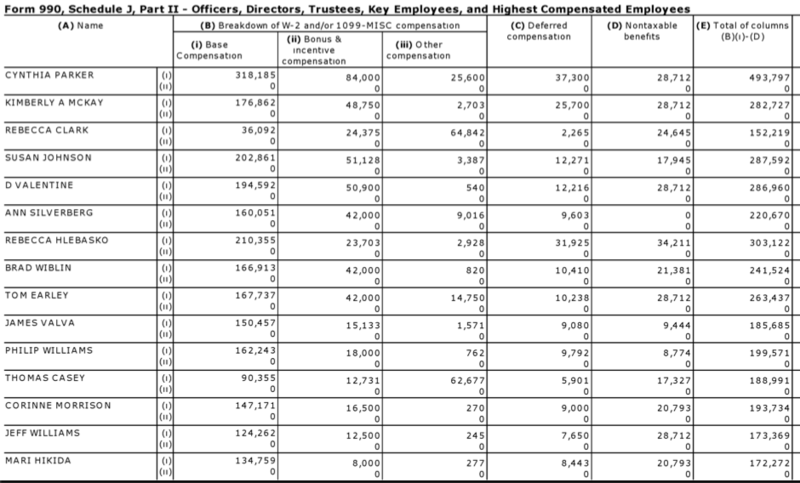 The total compensation of Bridge Housing’s CEO in 2012 was $493,000. 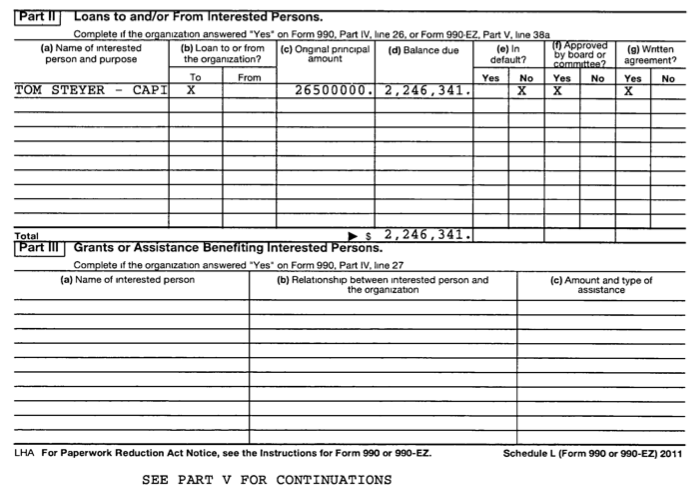 (Source: Bridge Housing Corporation IRS Form 99, 2012). The One PacificCoast Foundation directly supports Bridge Housing Corporation. Also on the board of directors of One PacificCoast Foundation, at least until 2011, is Rick Holliday. Holliday established Bridge Housing in the early 1980s and he remains on Bridge Housing’s board of directors. But Holliday’s main focus these days appears to be his own for-profit real estate company, Holliday Development. Holliday Development’s first project in 1988 was conversion of an industrial building in San Francisco’s SOMA into lofts. Today one bedroom units in the building, 601 4th Street, are priced at approximately $1 million. Before the crash in 2008 that brought the Bay Area’s real estate market to a brief standstill, Rick Holliday was betting big money on West Oakland. That year the San Francisco Business Times ran a profile on Holliday and explained his ambitions for West Oakland: “Some developers see West Oakland as the next South of Market, a San Francisco neighborhood transformed from an under-utilized industrial zone to a booming office and residential district.” Holliday said he was “bullish” on West Oakland real estate. SOMA’s median rent for a one bedroom apartment is currently about $2,500, making it one of the most unaffordable places to live in the United States. West Oakland’s rents are quickly rising too. Holliday’s marquee West Oakland project, the Pacific Cannery Lofts sold out last year. Prices in the 163 unit property ranged from one quarter million to half a million dollars, according to the San Francisco Chronicle.